Every now and then you come across a band that have something different and you want to call them your own. Sons of Morning offer something different in a rock n roll wilderness. Extremely difficult to label the band and shelve them in a certain genre, but if I had to it would be Rock/Country with a Blues enthused underbelly with a hint of Modernist Post Punk. 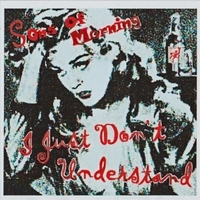 Sons Of Morning certainly have put together something special and when you listen to certain tracks you can hear snippets from sixties giants the Rolling Stones, the three 'super chords' from the Beatles, and also, I’m hearing American super rocker Tom Petty too. The rich and resonant bass lines throb and bounce from the Hoffner behind the crisp and exact guitar usually strung from a Gretsch Pro Jet or Les Paul and this generally dominates the Sons sound throughout each song, with the main theme being the Americana vocal which is somewhat developed in its own style, and finishes off a unique outing of pure brilliance. Summing up, The Sons offer a dramatic and intense, rhythmic, driving, angular sound that is quite contemporary though you must note each track has its own identity.